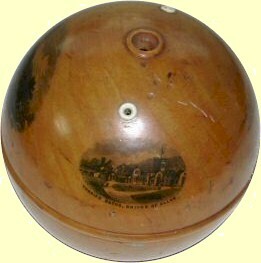 This late 19th century Treen wool holder is about ten centimetres in diameter and comprises two wooden hemispheres which fit into each other. A ball of wool is placed inside, and the wool drawn out as required through the small white circular opening. In this particular example, there are three illustrations on the top half. 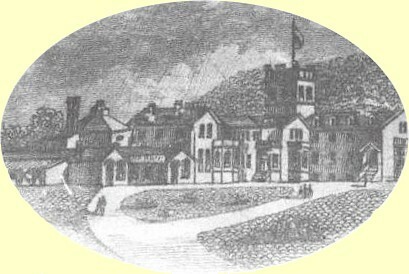 The largest is a general view of Bridge of Allan, and the two smaller ones are of the Well House and (shown above and in enlarged detail below) the Turkish Baths.